Despite chatting on a regular basis, Amy (Spunky Eclectic) and I don’t share our fiber club plans with each other, mainly because we trade subscriptions and don’t want to ruin the surprise. 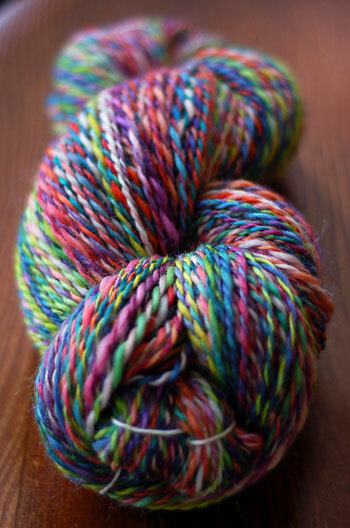 We were strangely in tune with our July club offerings, and now we both have lots of rainbow-y yarn at our disposal. We both chose sturdy wools with lots of crimp and body and happy, bright colors, in combed top form. Even the names are similar. To spin these, I folded the top in half and pulled it apart there, then split each half into strips as wide as my pinky, and spun those from the end. Half went on one bobbin and half on another, and I plied them together. Easy peasy and my favorite way to spin these spotty tops. I’ve become a very consistent spinner and rarely have more than a couple of inches left on either bobbin after the plying is done. It’s always cause for a little jump and clap in my seat. It’s the little things! There’s a lot more where that came from. I’ve got another skein of 160 yards done and as much wool again to spin, bringing me up to about to about 800 yards of worsted. Hmmm! Looks like it is time for more shawls, bsj’s and all manor of colorful squishy stuff! Yay! Every time I look at your blog, and your store for that matter, I feel myself edging closer to the spinning cliff. I’m almost ready to take the plunge! Whatever would you do??? Roll in the piles? Skip with glee perhaps? What a delicious problem to have! Beautiful work. umm, maybe give them away…to me. heh. LOVE the colors in the helloyarn lantern festival. i love how the colors interact with each other. very nice. 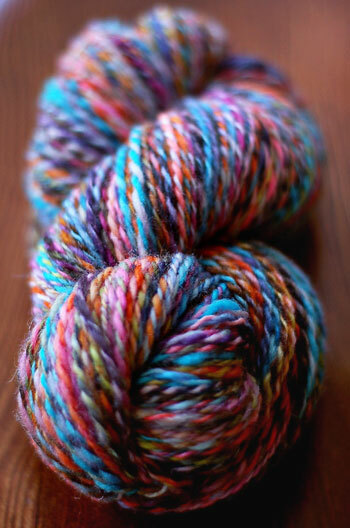 Lovely colorful yarns indeed! I can’t wait to see what you’ll knit with those. They are both wonderfully colorful. I like the note of green in “Lantern Festival”.